This is a filling and satisfying meal. The toppings and garnishes are what really give the flavor a punch and add visual interest. This would be good served on a bed of green salad and with parsely added on top, too. Toasting the rice before adding the water makes it fluffier and faster to cook. Serves about 6 people as the main dish. Preheat a medium to large pot over medium heat on the stovetop. Add just enough olive oil to coat the bottom, about 2 tablespoons. Pour in 2 cups of dry brown rice (I actually used a mixture of brown, wild and red rice) and stir while heating. There should be enough oil to lightly coat the rice and keep it from sticking. Add a chopped onion, 2 to 3 cloves crushed garlic, and about 4 to 6 teaspoons of your favorite seasoning mix. Continue stirring the rice until the popping sounds subside somewhat and the rice seems evenly toasted. Add 4 cups of water and 2 cups of red lentils. Bring to a rolling boil, then put the lid on the pot, turn off the heat, and leave the pot sitting on the burner. Let it sit for 20-30 minutes or until the water is absorbed and the rice and beans are tender. 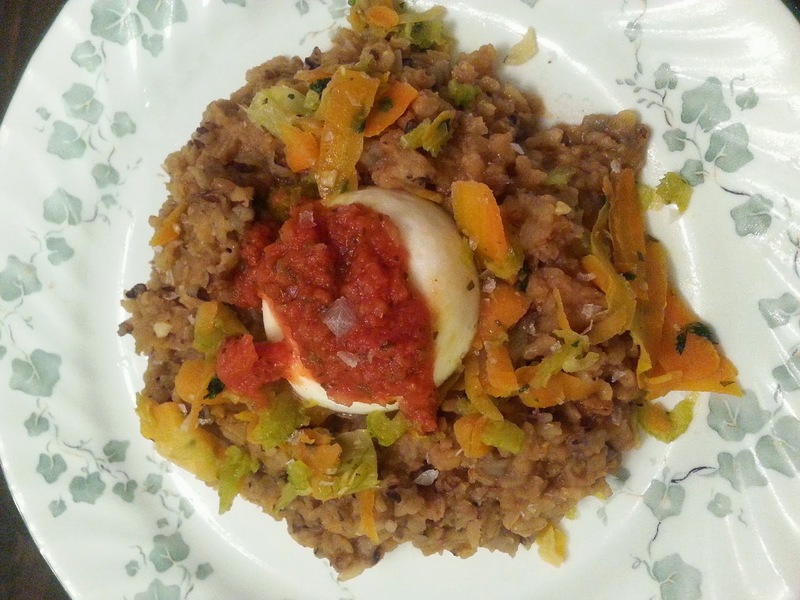 Poach an egg for each serving, and serve on top of the lentils and rice. Sprinkle flaked sea salt on top to taste. The flaked salt adds an amazing flavor and texture to just about any food. Garnish with your choice of cooked or raw vegetables (I used some leftover sauteed carrots, celery and onion), salsa, sour cream or plain yogurt, and chives and/or parsely.